Blessed are you who are poor, for the kingdom of God belongs to you. 2:21 Blessed are you who hunger <now>, for you will be satisfied. Blessed are you who weep <now>, for you will laugh. 2:22 Blessed are you when people hate you, and exclude and reject your name as evil on account of the Son of Man! 2:23 For their ancestors did the same things to the prophets. But woe to you who are rich, for you have received your consolation already. 2:25 Woe to you who are well satisfied with food, for you will be hungry. 2:26 Woe when people speak well of you, for their ancestors did the same things to the false prophets. for they will be rewarded for what they have done. 3:11 Too bad for the wicked sinners! It is astonishing that after those comparisons of Jewish writings with the blessings and woes in Luke, perhaps because of the inserted verse of Luke 6:23a which is not attested for Marcion’s Gospel and somehow disturbs the interlinking complementary structure of the combination, scholars in the past have not necessarily seen that in Luke the two sections of the blessings and the woes have to be read together. On the contrary, it was claimed that the audience of the beatitudes must have been a different one from that of the woes; and it was stated that both entities had ‘originally – seen from the history of traditions – nothing to do with each other’. 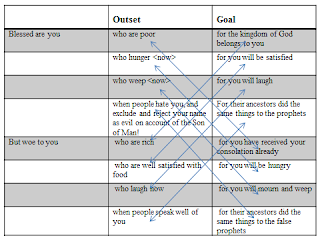 Looking at the table above, we have to deduce that Marcion set beatitudes and woes not only in a complementary, but in a strict cross-over way. The blessed end up where the rich start from and the rich start from where the blessed end up in. Poverty of the blessed not only resonates, but is an equivalent to those who have received consolation, as these riches are poor because of their own reputation and their worldly benefits which prevent them for longing for the kingdom of God. Even clearer are the next two beatitudes and woes where hunger corresponds directly with ‘being hungry’, and weeping with ‘mourning and weeping’. So, also, the fourth one, being hated, exluded and rejected corresponds with what happened to the false prophets. How do we have to interpret this cross-over structure? Both this cross-over structure and the strict correspondence between beatitudes and woes result in the following: the state from which the beatitudes start, namely from the poor, the hungry, the weeping and the hated are precisely the states into which the woes lead: rich who ends as a poor, the satisfied who ends as somebody hungry, the laughing who ends as mourner and the well spoken of who ends being regarded like the pseudoprophets, namely hated and rejected. Therefore, even those who, from the outset, are in a precarious position and seem to be cursed are promised that they will end up in those positions in which the blessed are already now. So, even the one who is rich now and has already received consolation, will also inherit the kingdom of God, will finally be satisfied in a different way, not just from food, will laugh a different laughter and will no longer be regarded as pseudoprophet, but will share the fate of Christ, namely be hated, excluded and rejected on account of the Son of Man. Or put the other way: Marcion dissolves the damning character of woes through their corresponding blessings on which those woes had been based and to which they finally will lead. As we will learn later, Luke has a different understandings of Marcion’s woes, because for him, as demonstrated by Luke 10:13-5, the woes are part of judgement and condemnation, while Marcion’s woes even with regards to the Pharisees and the teachers of Law (see The Gospel 7:42-52) are ‘brought up against them’ not as the Creator would do in a ‘stern’ manner, but full of mercy. Christ reminds his disciples that, yes, the one is cursed who brings about ‘stumbling blocks’, and that ‘it would be better for him to have a millstone tied around his neck and be thrown into the sea than for him to cause one of these little ones to sin’, but Jesus insists that such will not be the outcome even for the gravest sinners, and he continues: ‘If your brother sins, rebuke him. If he repents, forgive him. Even if he sins against you seven times in a day, and seven times returns to you saying, “I repent”, you must forgive him’ (TG 11:1-4). Rebuke and corrections are not the final say, curses are no longer curses, are neither judgement nor condemnation, but lead to forgiveness and blessedness. Our reading is confirmed by Tertullian’s commentary on Marcion’s version of the beatitudes and woes which express God’s radical mercy sounds ridicoulus and unacceptable for Tertullian. He criticizes Marcion in the beginning of this section on the woes that the supreme God of Love like ‘Epicurus’ god’ ‘does not even censure a man for his own sins’. Tertullian evokes Lucretius’ first theological prooem. ‘In the midst of the unrest of the present times – belli fera moenera (32), patriai tempore iniquo (41) – Venus is invoked as the sublime mistress of Mavors armipotens’, it unfolds ‘into the Hellenistic picture of Mars lying in the lap of Venus, embracing and embraced. The request itself is: grant us peace!’ Not by chance did Tertullian allude to this Epicurean passage, as Lucretius quotes ‘the famous first kuriva dovxa of Epicurus: To; makavrion kai; a[fqarton ou[te aujto; pravgmata e[cei ou[te a[llw/ parevcei.’ The verses formulate ‘the peaceful existence of the Epicurean gods’ in ‘a solemn manner’ of a ‘sorrowless life’ in order to provide human beings to become ‘unchallengeable and blessed’. Tertullian reports that Marcion sees woes not as ‘malediction’, but ‘as admonition … without the spur of commination’ and adds critically that he cannot understand how one can conceive of a God who admonishes without thinking that he is also ‘going to inflict punishment’. This radicality of Marcion which maintained that the curses were no longer curses, but adminitions that lead to blessings, this theology of love without threat and vengeance, without punishment and reproach, even for the rich, the satisfied, the ones that laugh and are well spoken off – was apparently not upheld even amongst the Marcionites. Tertullian reports that ‘there are others [than Marcion] indeed who admit the word involves cursing, but will have it that Christ uttered the word Woe not as proceeding strictly from his own judgement’, hence they removed the curses from Christ’s mouth and suggested that ‘the word woe comes from the Creator’. For Tertullian, in both cases, the result, was the same, namely that to demonstrate the ‘Creator’s severity, and so give greater commendation to tolerance previously in the own beatitudes’ of the supreme God of love. See Isa. 3:10-1; Eccl. 10:16-7; Tob. 13:12-4; 2Enoch 52; syrBar 10:6-7. This has not been recognized by H. Schürmann, Das Lukasevangelium II/1 (1993), 337 who, although stating that the woes have to be interpreted in the light of the blessings and that all those addressed in blessings and woes form ‘the same group of people’, he, then, goes on to contrast two groups, those who are blessed and those who are woed. See Tert., Adv. Marc. IV 27,10. Tert., Adv. Marc. IV 15,1. Lucr. I. 44-49; see P. Friedländer, ‘The Epicurean Theology’ (1939); R. Braun, ‘Tertullien et les poètes latins’ (1967 = 1992). P. Friedländer, ‘The Epicurean Theology’ (1939), 368. P. Friedländer, ‘The Epicurean Theology’ (1939), 369. Tert., Adv. Marc. IV 15,3. Tert., Adv. Marc. IV 15,4.